Is Your Full Armor On? It’s been a long time since I’ve blogged, and it’s nice to be back! We’ve had quite an interesting couple of months. After almost 10 years in the same place, we now have new jobs, new dwellings, a new church hunt, are in new states…and my “new” list could keep going on and on. Thankfully, there is one part of our lives that has stayed the same–home schooling. We are getting to that point, though, of having “spring fever.” The point where the weather is was just starting to get warm, the days are getting longer, and the days of school are easier to count down, then count up. Yipee!! Summer is coming, but it’s not here yet. I think I’m having to tell myself this even more than my son. I felt like we needed something to break our routine. We needed something interesting, but also something to refocus our hearts and minds so that we could keep ourselves from growing frustrated with each other, and complacent with our spiritual walk. My son is memorizing Ephesians 6 for school. In this chapter, Paul speaks of putting on the whole armor of God. Since my son is very interested in the military, I thought it would be fun to study the armor of God from a soldier’s perspective. I searched the Internet and found a curriculum a church used for VBS, but it wasn’t exactly what we needed, so I altered the idea and made our own “Soldier in the Army of God” field guide and study. This is a short two week study. I’m going to touch on some of the highlights for each day, but you can click on the link below and have all of the instructions and information to help with the daily lessons. Although this video is based on ancient warriors and battle armor, it is so inspiring that I had to include it. Please watch and be inspired to put your armor on! Background: In ancient times, the belt was the most important part of the armor, because all of the other pieces of the armor were attached or fitted to the belt. If the soldier didn’t have his belt, he wasn’t going to make it in the battle. Soldiers today also have a belt. They have their guns attached to their belts, as well as some forms of protective vests. Application: We know the Bible is true. The belt of truth is the Word of God, and it is the only true foundation we have. If we don’t have it, then we will never win the battle. Without it, none of the other parts of the armor even matter. -Vests can wear out and need to be replaced. Sometimes we get tired and weary of the Devil’s tactics. We can’t give up though. We may only need to refresh our vests and start clean again. We, as Christians, are to be prepared to always give an answer of “the Hope that is within us.” Christians have the opportunity to go and spread peace in this “war zone” that we call the world. We used Velcro and stuck the sticky side to the shield. He wanted to use a glove, because he said the Velcro poked him. He loved the hammering part, of course. Soldiers/ police officers, etc. use shields even today. They are sometimes nearly as tall as the person holding them. In ancient times, they were made out of many different types of metal, depending upon what they had available in that time period. Some were even made like tightly woven baskets. The soldiers would put the shields all together to create a type of wall to hopefully keep the “fiery darts of the wicked” from piercing through the shields. The shield was vital to the soldier. Without it, they had no hope of survival. Application: This is true for our Christian life today. We must have faith that Jesus has risen from the dead and that he is victorious over death and hell. To keep us from being discouraged by the Devil, we need to take on the shield of faith each day. Helmet Info: In ancient days, the helmet was personally created for each soldier. The soldier couldn’t just pick a helmet off a shelf and use it for battle. Every detail had to be tailored to the unique person, or the soldier would be unfit to fight in the battle. The blacksmith would take many different measurements to ensure that the helmet would be comfortable and functional for each soldier, allowing the soldier to see through the eye slits, to have his cheekbones, nose and neck protected by the intricately molded metal. This can be compared to our salvation. We have to make the personal decision for ourselves. We can’t rely on the “helmets of salvation” of our friends or family and just slip those one, expecting to be protected. Like a soldier, we are only protected by our own helmets of salvation. We have to make a personal decision to accept Jesus Christ as our Savior, in order to survive the spiritual warfare of our land. Note: This, of course, was my son’s favorite day. He loved using the dagger. I felt alright with it, as long as we stressed that we were “cutting” out evil and not just stabbing everything we saw! We used our “swords” to destroy the lies of the enemy. We can pray sincerely anywhere and everywhere. We need to pray in the Spirit of the Lord and not just have a memorized prayer that is meaningless. ID Tags (IDentify with Christ) – See the attached page of the Field Guide for the information about the ID tags. The Bible says that when we are saved we become a new creature. We “die” to ourselves and we start living for Christ. If you write your info backwards, when you turn it over, it’s raised up. It was easier for me to write what Carson wanted on a piece of paper, and then he copied it on the foil. 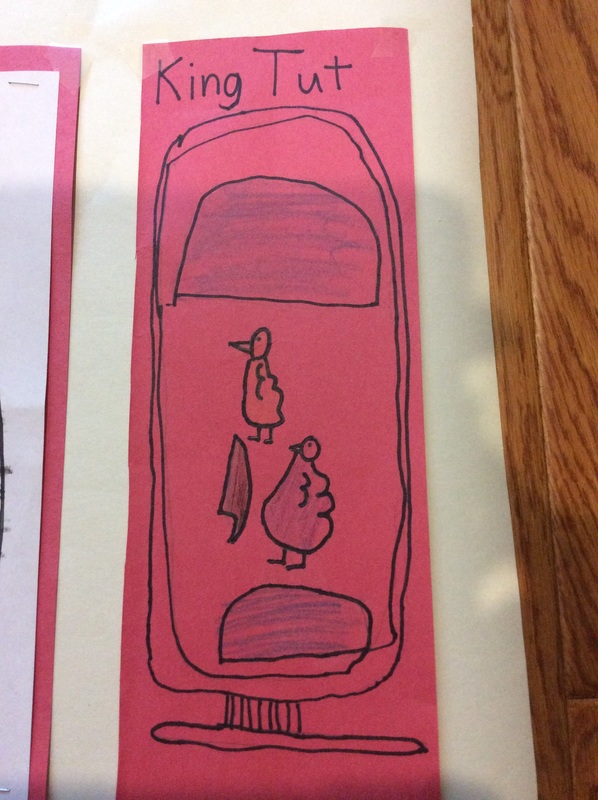 You can use the pictures of ID tags in the Filed Guide instead and have your child write on them, if you don’t want to fool with actually making them, but my son LOVED making them with the aluminum foil. When you write on them, they look raised up like it’s actually stamped on the metal. Pretty cool. I hope this is as meaningful to you and your child as it ended up being to us. I learned a lot in the research, and Carson loved relating it all to a soldier. We have referred back to these truths many times, in dealing with his attitude and Christian walk and how he should be “suiting up” in the armor each day. So, get your armor on and enlist in the army of the Lord! 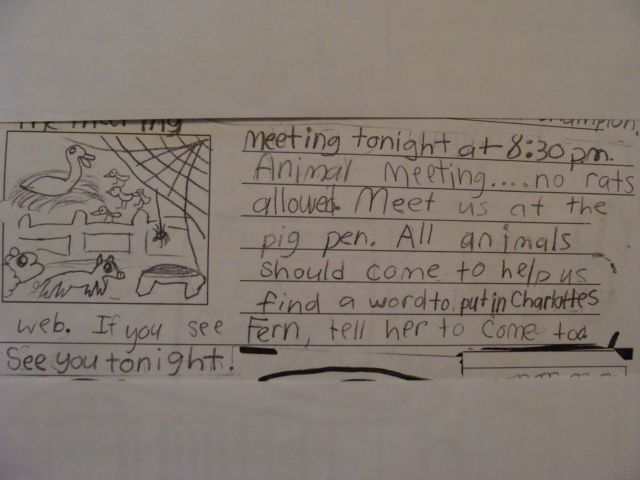 This was a simple idea I used when I taught 3rd grade at Cornerstone Academy. Carson and I are studying the moon in Science, using Apologia Science, which I am falling in love with. They tie the Bible in with science so flawlessly, and they explain it on Carson’s level, even giving ways to refute Evolution and prove Creationism. Love it. So, we have done various activities with the moon–modeling a lunar eclipse, finding our weight on the moon, charting the phases of the moon, and even measured how high Carson could jump on the moon (the formula is: 6xs however high you can jump). But I decided we needed something edible! So, we created the Edible phases of the moon😊. You will end up with 8 cookie circles (obvious, I guess). The neat thing is that as you cut one phase, the opposite phase is formed from what’s left. For example: When you cut the Waxing Crescent, what’s left is the Waxing Gibbous. When you cut the First Quarter moon, what’s left is the Third Quarter, etc (see chart below). The only thing you have to do is be careful when transferring the part you cut to the other half of the cookie. We ripped one of the moons, but were able to just smoosh it back together and form it again. Of course they aren’t perfect, but they were cut by Carson, molded by Carson, arranged by Carson, and will be remembered by Carson. As I mentioned in another post, he is a very kinesthetic and visual learner. He remembers by doing and seeing. Hope you all have a wonderful Toosh-day, I mean Tuesday. (Please don’t be offended. It’s too cute, not to laugh). 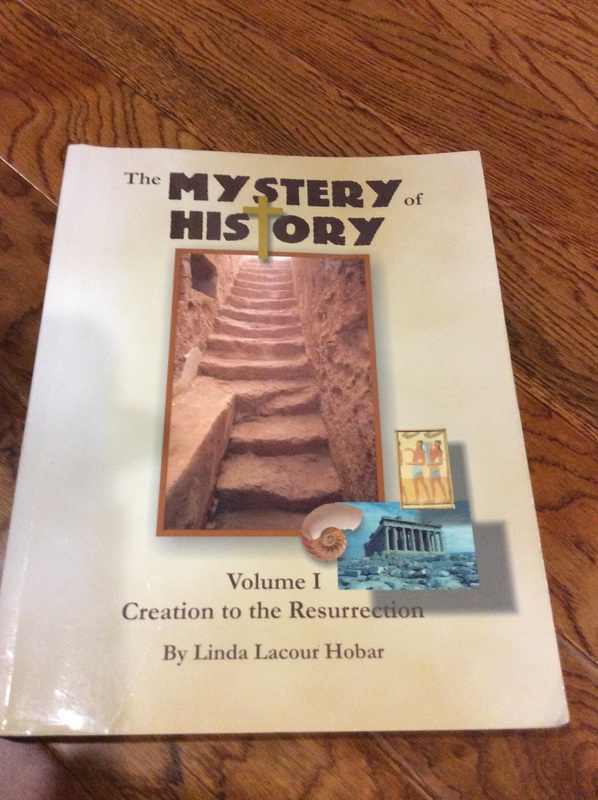 Have I mentioned that We love our History curriculum, The Mystery of History? 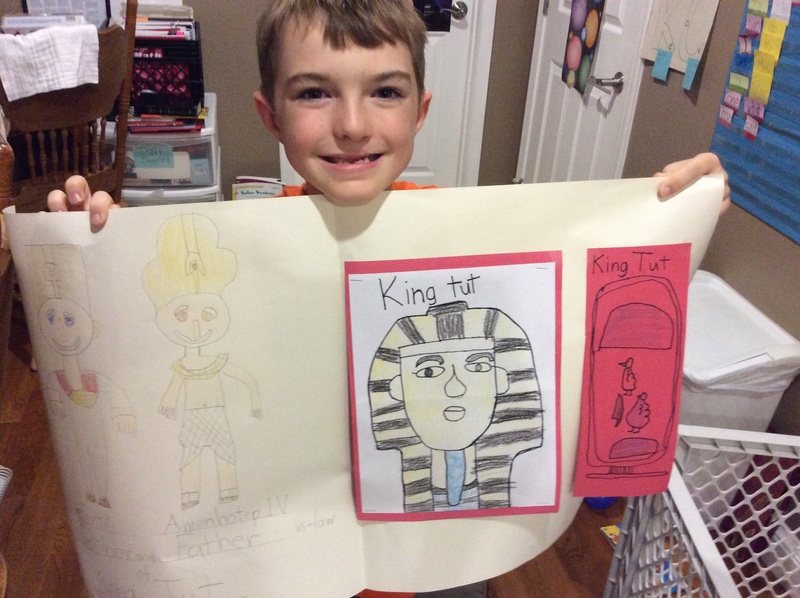 We finished our ancient Egypt unit and our tomb drawings😊. 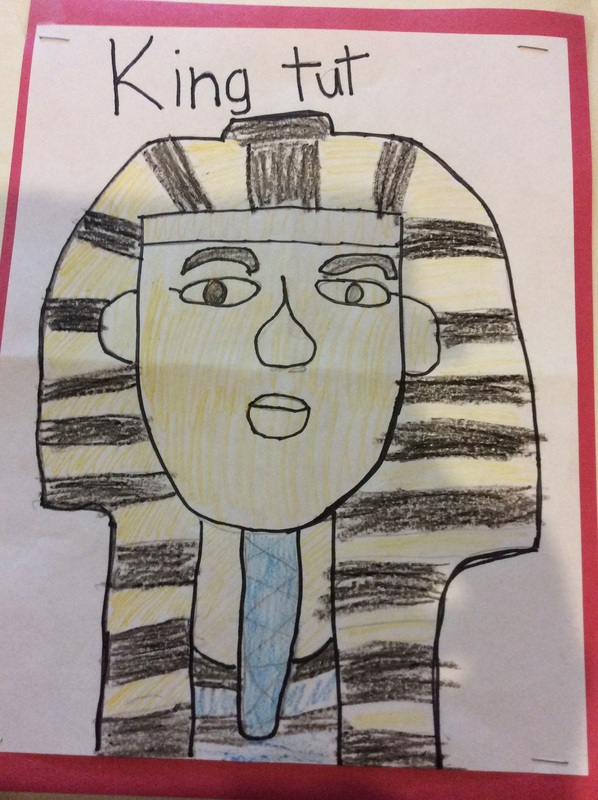 We learned about King Tut and his family. Carson drew their murals. Carson also learned the archeologists’ first step in breaking the code of Heiroglyphics, deciphering the names of the pharaohs inside of the oval-type shapes, called cartouches. 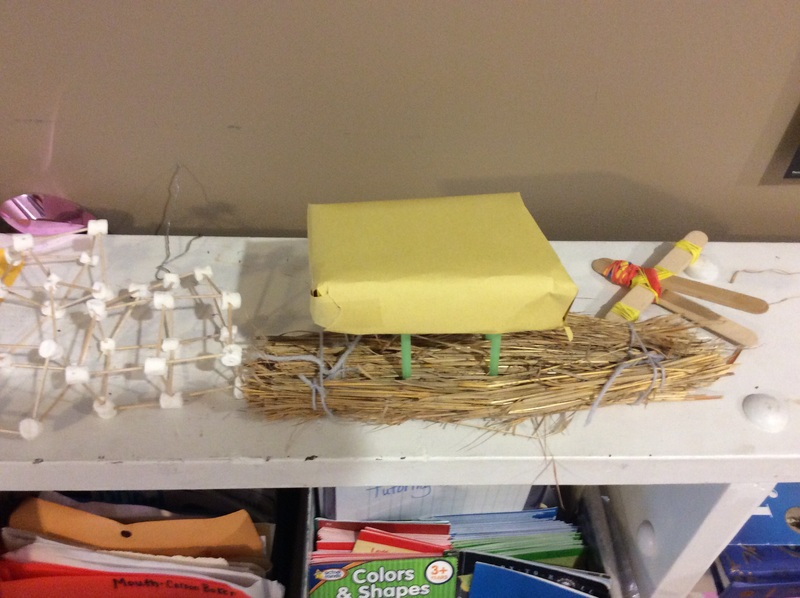 We collected the “reeds” for his Egyptian boat. He was very happy that it actually floated😊. 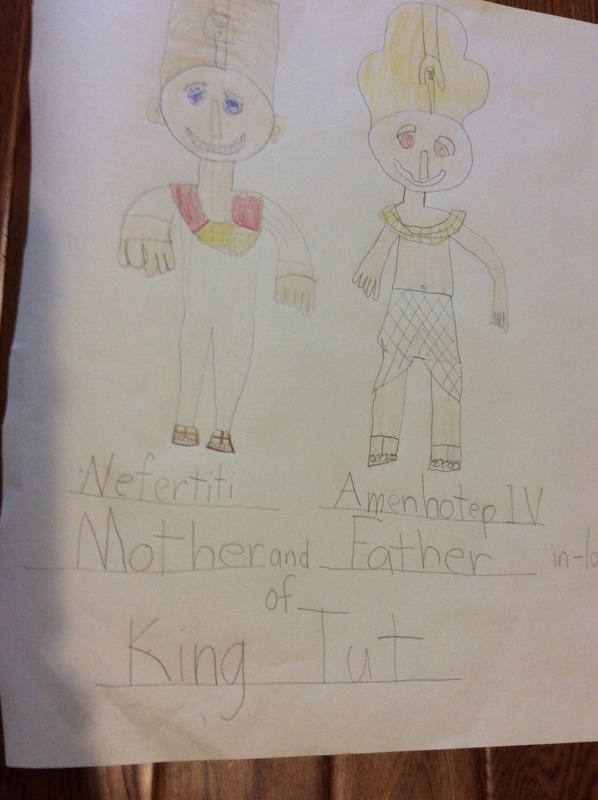 I love this curriculum, because it weaves world history right along with Biblical history, showing the children how seamless the two truly are. After all, why do we study history? We study history so as not to repeat the mistakes of the past. Above all, I pray Carson learns this. I believe it would change his life. Third graders, a hill, a cross, and some…rocks. Yep, it all sounded pretty innocent until I got to the “rocks” part, right? At any other time and in any other place, I, the teacher would have been adamantly against putting those two together. Who, willingly, hands a 9 year old a rock and says, “Throw this down the hill.” Hmm…me, I guess. I love this stop the most, because of how seriously the students take it. Previously, my husband had placed a large wooden cross on top of the hill on the path, and the kids and I gather around the cross. I had them choose a small rock from the path and use their markers to write a fear or a sin they struggle with on their rock. We discuss how the Bible says that Jesus died for these sins and fears and when we give them to him, he will take them from us forever and help us overcome them. We don’t share these with each other. This is just a private time between each child and the Lord. This year, though, it was a little different. As I was talking about the fears and concerns we may have, it hit me. I remembered the worry I had written on my own rock last year. I’d written one word “miscarriage.” I’d silently thrown it into the woods with the rest of my students’ rocks, praying that the Lord would take the hurt and the worry and the fear away, and that He would see fit to bless us with another child one day. As I stood on that hill, surrounded by the little upturned faces of my third graders, I realized the Lord had granted my wish. There I stood, 8 months pregnant, the child I prayed for growing and living within me. Of course I got all choked up and my students looked at me like I was crazy. After I got myself straightened up, we prayed over our rocks and then one by one we tossed them down the hill and into the woods. 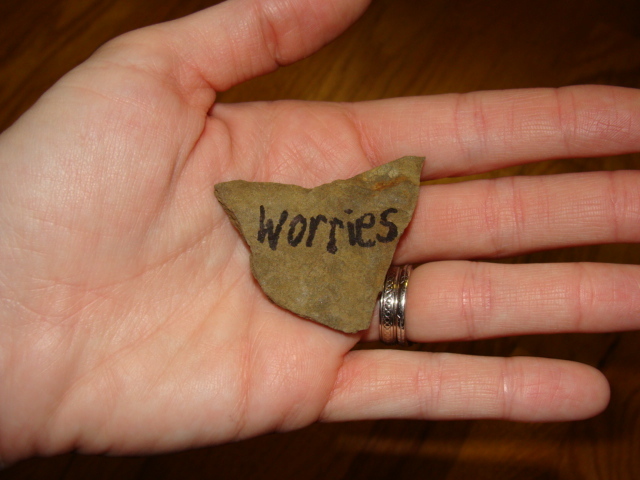 For some reason, the new worry I’d just written on my rock seemed insignificant. Again, my faith had been strengthened. God was going to take care of me and all of my worries. We then let our heavy backpacks we’d been carrying roll down the hill, representing Christ lifting our burdens. We talked about salvation and how Christ lifts our burdens of sin. All in all, it was a wonderful Spiritual journey–one I hoped my little pilgrims would always remember. Little did I know, this journey was about to become even more memorable…and sadly, a lot less spiritual. So, you guessed it! For three years, my class and I had been pelting this farmer’s property with mysterious rocks with sins, worries and concerns written on them. The worries we thought were lost in the woods, never to be found again (like Jesus casting our sins in the deep blue sea) were not lost–instead, they were just causing someone else to worry–the poor farmer! The moral of this story is clear. Never disregard your mother’s warning to you as a child. She was far wiser, than I ever thought–don’t throw rocks. 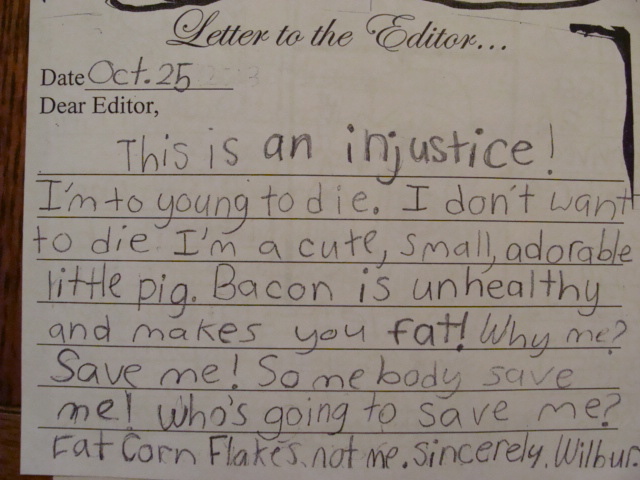 I had to share what a wonderful job my little 3rd graders did on their newspaper projects. 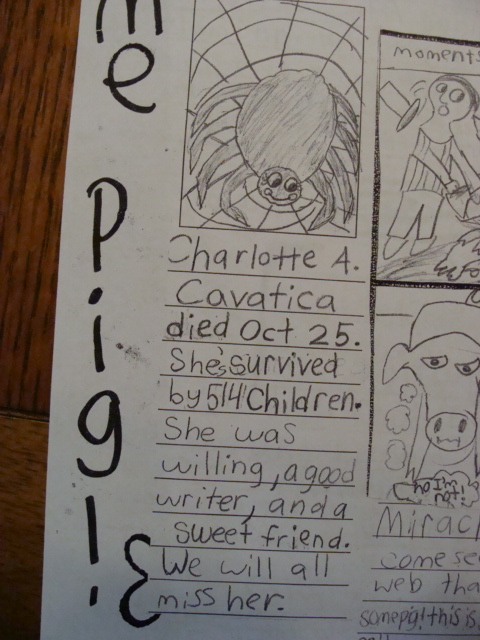 As we read Charlotte’s Web this year, we created a newspaper from the farm animals’ points of view. 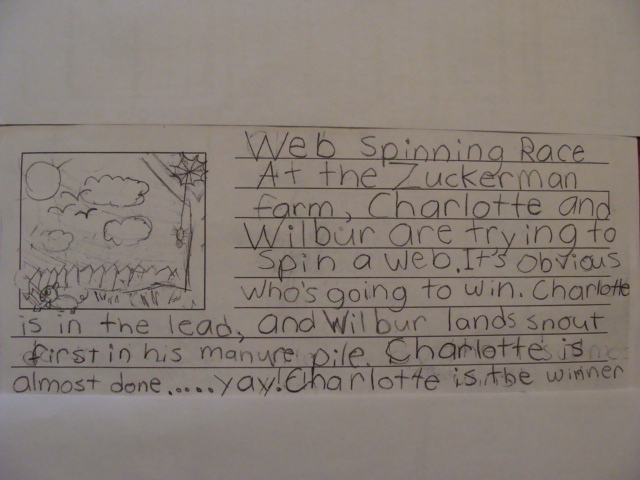 The students voted to title it The Zuckerman Farm News. After reading each chapter, we wrote an article based on what was going on in the chapter. For example, in chapter 1, Wilbur is born. 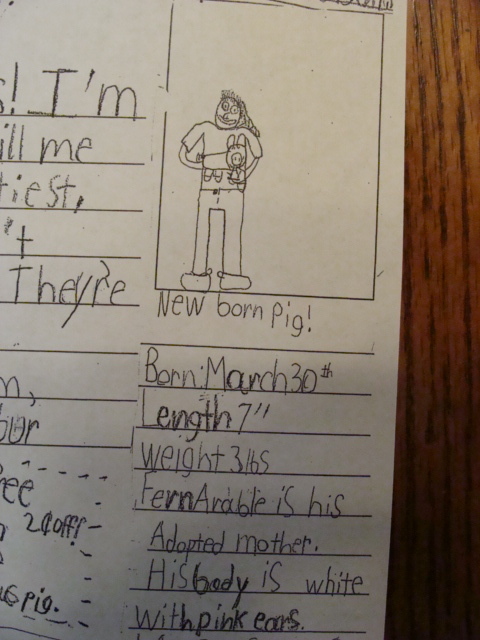 My students wrote a birth announcement for Wilbur, giving his description, weight, color, etc. 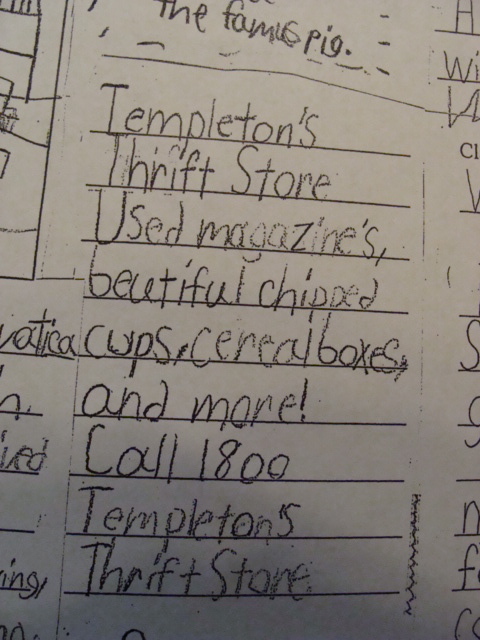 Over the course of reading all 22 chapters, we wrote classified ads, announcements, letters to the editor, poems, drew comics, and sadly, wrote Charlotte’s obituary. Here’s a peek at some of the articles they wrote. 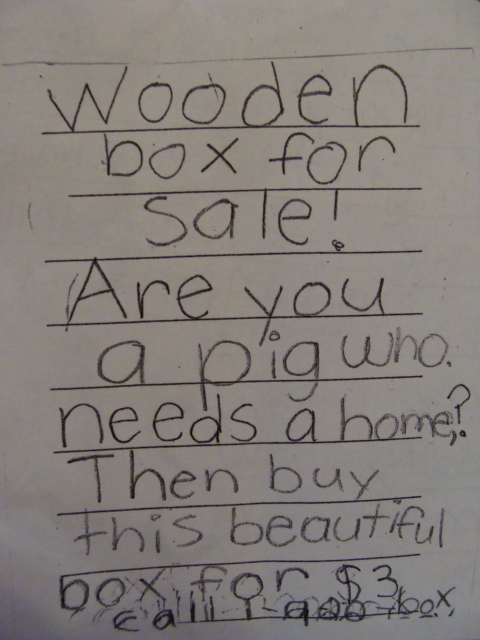 Classified ad selling Wilbur’s old house at the Arable farm. After each student finished adding his or her article, I copied them and we gave them out in our school—just in time for our annual school-wide County Fair (celebrating the completion of our novel).